I have a special treat ((pun intended)) for y'all today! Erika from Rouge & Whimsy is going to share a recipe for homemade granola. YUM! Homemade granola is not only delicious, but very simple to make. You can whip this up in less than an hour and impress all your friends while hardly breaking a sweat in the kitchen. It lasts for up to three weeks and works great as a gift. and if you like your granola a little sweeter, add in 1 tbs of brown sugar. In a large bowl, mix the oats, almonds, coconut, pepitas. Spray two baking sheets (rimmed baking sheets will make your life easier) with PAM or other industrial spray and spread a thin layer of granola mix over each. Add the dried fruit and toss to combine. Let cool. Eat often. recipe altered from Real Simple. 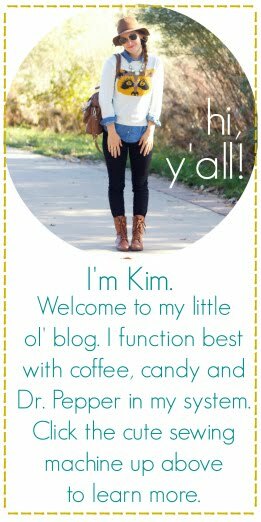 Thanks Kim for letting me share on your blog today! hmmm I love granola, I'll have to whip some up soon! Oh, this sounds delicious! John and I go through granola like crazy, so I should try my hand at making it myself! I have to make this! Yum! & I never realized that unhulled pumpkin seeds had a name! hehe. Oh yum! I love granola. I will definitely have to try this. mm mm yummy! this looks soo delish and healthY! !